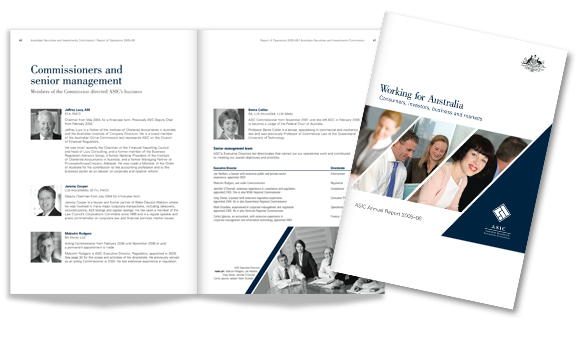 For two years, we created the annual report for ASIC. Accuracy and attention to detail are key with this client, whose performance is reviewed by parliament and the media every year. We used a classic, sophisticated design, and commissioned photography that emphasised the achievements of the organisation at the beginning of the report. of the real people behind ASIC’s achievements had been used. Our 2006 annual report for ASIC won a gold Annual Review Award, and the organisation was delighted with the new design.